Billing Customer Service Representative coordinates and takes care of the billing details of the organization’s customers. The most common responsibilities listed in the Billing Customer Service Representative Resume sample are issuing invoices, handling payments, answering to queries of the customers, updating financial records, promoting products, giving instructions, update bill status, give necessary guidance, information and solve the billing issues. Those seeking to become a Billing Customer Service Representative should have a courteous attitude, good communication skill, and Patience and computer knowledge. 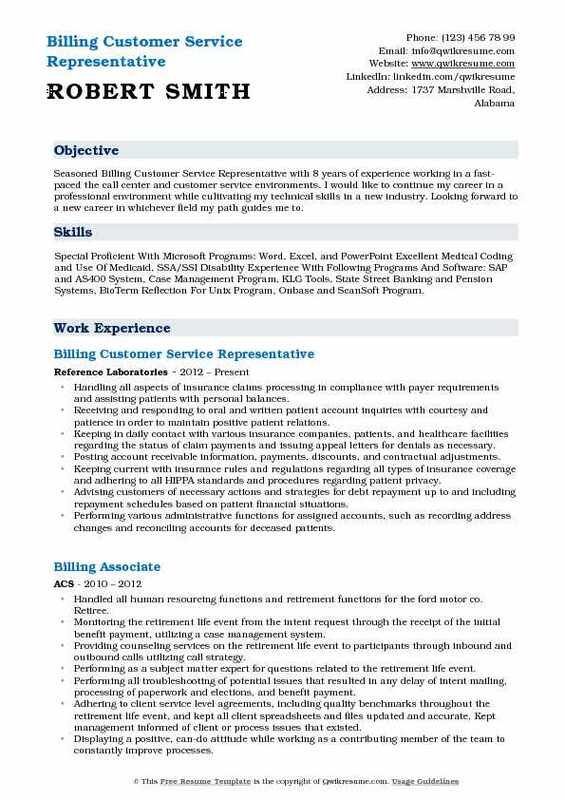 A best Billing Customer Service Representative Resume displays a Bachelors degree in marketing, communication for seeking this post, however, a high school diploma is also considered as a minimum qualification by some employers. 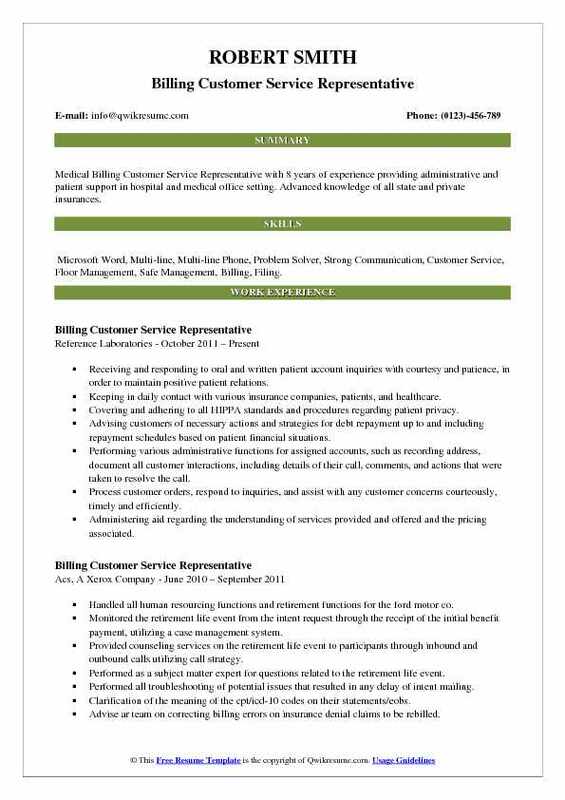 Objective : Two plus years of experience as Billing Customer Service Representative in Health domain is seeking to secure a position that will allow me to utilize my experience within all facets of customer service, reception and administrative across diverse industries. Skills : Microsoft Office, Microsoft Excel, Emdeon Billing Interface, Customer Service, Account Auditing, Data Entry. Conferring with customers by telephone or in person in order to provide information about products and services, to take orders or cancel accounts, or to obtain details of complaints. Keeping records of customer interactions and transactions, recording details of inquiries, complaints, and comments. Resolving customers service or billing complaints by performing activities such as exchanging merchandise, refunding money, and adjusting bills. Referring unresolved customer grievances to designated departments for further investigation. Determining charges for services requested, collect deposits or payments, and/or arrange for billing. Reviewing insurance policy terms in order to determine whether a particular procedure or service is covered by insurance. 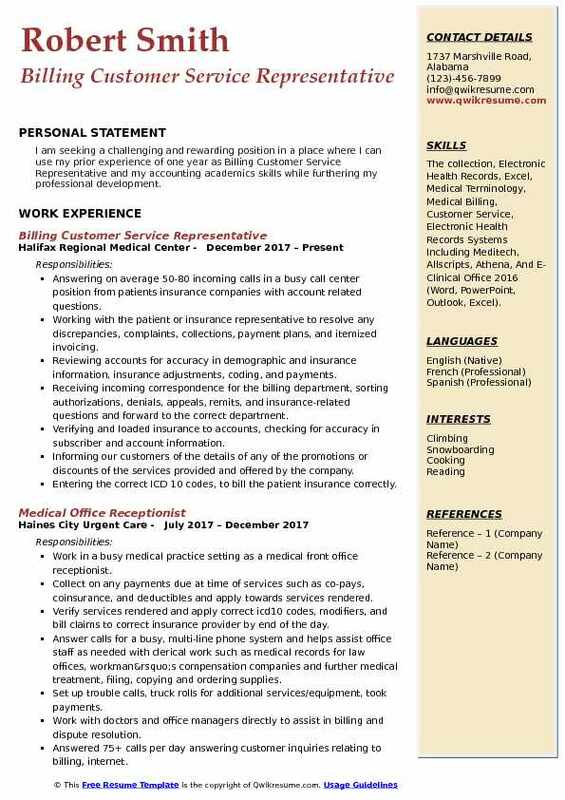 Headline : Billing Customer Service Representative with 6+ years of experience is seeking a position in the medical field utilizing education, and skills gained from previous work experience. Skills : Specialized ICD-9, CPT 4 and HCPCS Coding Medical Laws and Ethics HIPAA & CPR Certified HCPCS Coding Principles CMS-1500 Forms, EOB, and Patient Charts Medical Mastermind, MediSoft, Bravo, Insurance Form Preparation, Claims Processing, Billing Procedures, and Follow-up Medical Terminology, Patient Records, and Scheduling Appointments. Medical Laws and Ethics. Assisting patients, attorneys and insurance companies with inquiries regarding accounts, billing, insurance claims, budget plans, post payments, credit transfers, adjustments and reimbursements, and resolving these concerns in accordance with JCAHO, NCQA, and other relevant government standards. Processing customer refunds, account adjustments and resolves client discrepancies. Responsible for monitoring and maintaining accounts. Ensuring prompt resolution of customer concerns by working with insurance companies, physician offices, hospital or coding, and compliance. Reviewing daily, weekly, and monthly call reports and reports results to contact center leadership when required. Assisting in the development of training materials and protocols and train staff on approved usage of software and contact center/ PDI protocols. Resolving customer service complaints following contact center/ PDI protocols. Assisting customers in obtaining the status and delivery date of their packages, putting in claims for lost or damaged packages, also providing refunds to customers. Adding credits and reviewing billing invoices with account customers. 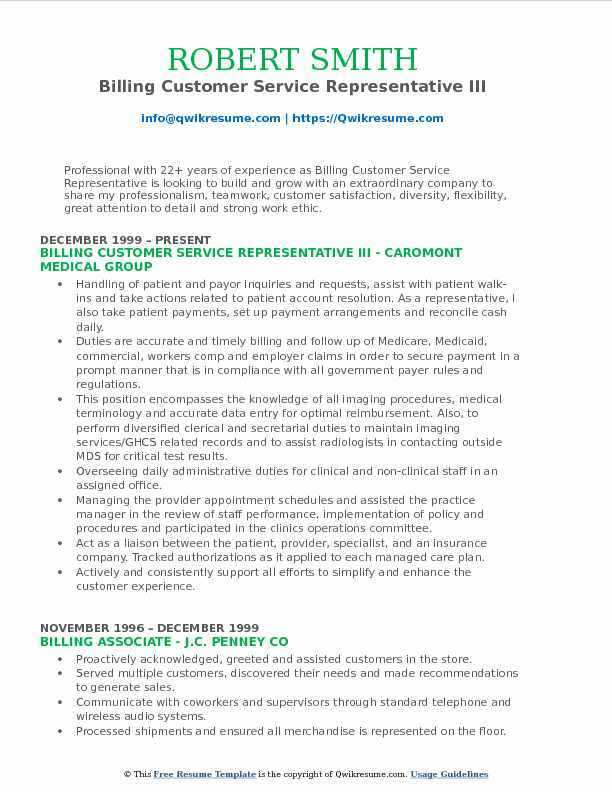 Summary : Medical Billing Customer Service Representative with 8 years of experience providing administrative and patient support in hospital and medical office setting. Advanced knowledge of all state and private insurances. Skills : Microsoft Word, Multi-line, Multi-line Phone, Problem Solver, Strong Communication, Customer Service, Floor Management, Safe Management, Billing, Filing. Receiving and responding to oral and written patient account inquiries with courtesy and patience, in order to maintain positive patient relations. Keeping in daily contact with various insurance companies, patients, and healthcare. Covering and adhering to all HIPPA standards and procedures regarding patient privacy. Advising customers of necessary actions and strategies for debt repayment up to and including repayment schedules based on patient financial situations. Performing various administrative functions for assigned accounts, such as recording address, document all customer interactions, including details of their call, comments, and actions that were taken to resolve the call. Process customer orders, respond to inquiries, and assist with any customer concerns courteously, timely and efficiently. Administering aid regarding the understanding of services provided and offered and the pricing associated. Providing technical support for health portal related issues, assisting patients to enroll, reset passwords and update email. Objective : Dedicated Billing Customer Service Representative with 3 years of experience is seeking a career in the Medical Administrative field. Proven skills in customer service, insurance investigation, billing dispute and resolution, and coding compliance, along with excellent time management skills and attention to detail allow for superior work in remote or in-house environments. Skills : Event Planning, Excel, Microsoft Office, MS Office, Outlook, Customer Service, Billing, Coding, MS Outlook Knowledge Of Medicaid Statutes and Regulations Independent Judgment and Decision Making Knowledge Of Medicare Guidelines Web Dennis CPT Coding C-Snap ICD 9 Coding Insurance Verification Promotes Positive Behavior Insurance Authorization. Skillfully developed departmental goals, objectives, standards of performance, policies, and procedures. Take inbound calls for the billing department, billing for visiting physicians and visiting podiatry, verify insurance, write up refunds, post patient payments, determine patient eligibility for financial hardship, collections, locate correct addresses for returned mail, and process credit card payments. 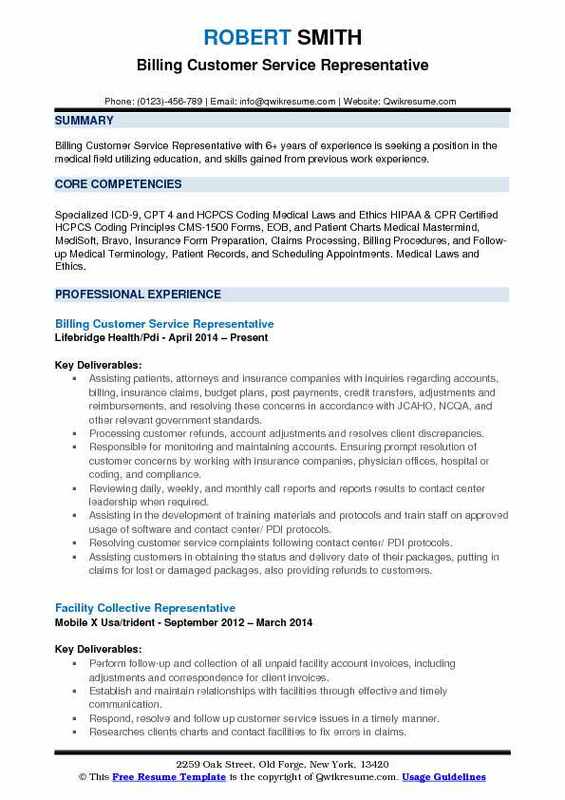 Objective : 4 + years of successful experience in Customer Service as Billing Customer Service Representative. 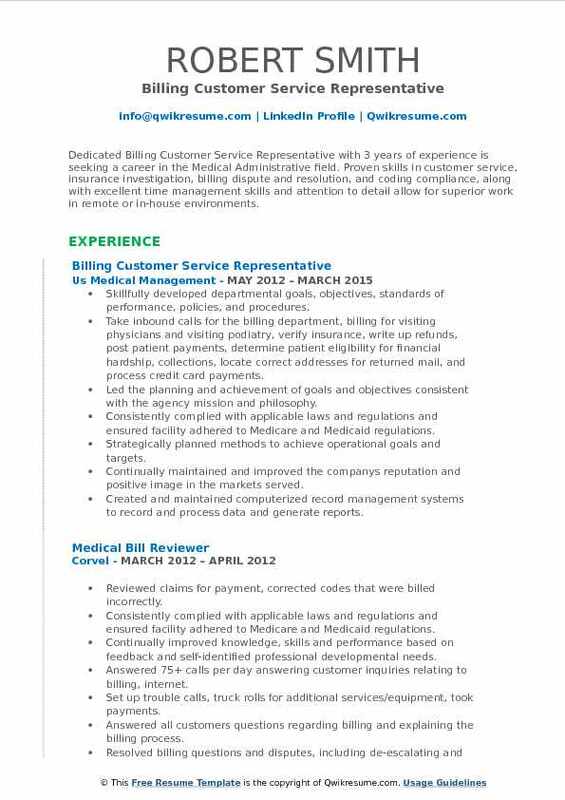 Healthcare professional with key experience in Billing, Coding, Problem-Solving and Problem Analysis. Skills : Communication: Verbal & Written, Bilingual, Fluent In English and Spanish. Computer: Data Collection and Ordering (Microsoft Word, Excel, PowerPoint), Office Management, Data Entry. Answering patient and customer questions regarding billing and statements. Tracking and responding to customer specific reporting requirements i.e., call back, fax. Notating the conversation on the patient's invoice in a practical and concise manner. Responsible for processing customer payments and make payment plans. Recording insurance information provided by patients to update account information. Contact customers in order to respond to inquiries or to notify them of past due amounts needing to be paid to continue service. 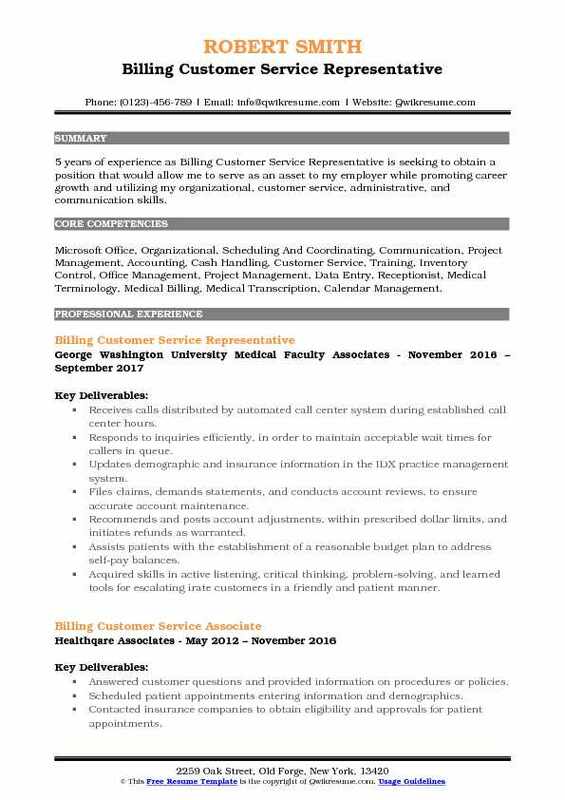 Summary : Seasoned Billing Customer Service Representative with 8 years of experience working in a fast-paced the call center and customer service environments. I would like to continue my career in a professional environment while cultivating my technical skills in a new industry. Looking forward to a new career in whichever field my path guides me to. Skills : Special Proficient With Microsoft Programs: Word, Excel, and PowerPoint Excellent Medical Coding and Use Of Medicaid, SSA/SSI Disability Experience With Following Programs And Software: SAP and AS400 System, Case Management Program, KLG Tools, State Street Banking and Pension Systems, BioTerm Reflection For Unix Program, Onbase and ScanSoft Program. Handling all aspects of insurance claims processing in compliance with payer requirements and assisting patients with personal balances. Receiving and responding to oral and written patient account inquiries with courtesy and patience in order to maintain positive patient relations. Keeping in daily contact with various insurance companies, patients, and healthcare facilities regarding the status of claim payments and issuing appeal letters for denials as necessary. Posting account receivable information, payments, discounts, and contractual adjustments. Keeping current with insurance rules and regulations regarding all types of insurance coverage and adhering to all HIPPA standards and procedures regarding patient privacy. Performing various administrative functions for assigned accounts, such as recording address changes and reconciling accounts for deceased patients. Summary : Professional with 22+ years of experience as Billing Customer Service Representative is looking to build and grow with an extraordinary company to share my professionalism, teamwork, customer satisfaction, diversity, flexibility, great attention to detail and strong work ethic. Skills : Analysis And Resolution, Strong Research, Verbal, Written And Communication, Proficient In Microsoft Systems, Productive In A Team Or Independently, Data Entry, Leadership, Technology Literate, Medical Terminology, Advanced Typing, Medical Coding And Billing, Financial Services Experience, Flexible And Adaptable, Exceptional Customer Service, Functional In A Deadline Driven Environment, Effective Organizational, Multitasking And Prioritizing. Handling of patient and payor inquiries and requests, assist with patient walk-ins and take actions related to patient account resolution. As a representative, I also take patient payments, set up payment arrangements and reconcile cash daily. Duties are accurate and timely billing and follow up of Medicare, Medicaid, commercial, workers comp and employer claims in order to secure payment in a prompt manner that is in compliance with all government payer rules and regulations. This position encompasses the knowledge of all imaging procedures, medical terminology and accurate data entry for optimal reimbursement. Also, to perform diversified clerical and secretarial duties to maintain imaging services/GHCS related records and to assist radiologists in contacting outside MDS for critical test results. Overseeing daily administrative duties for clinical and non-clinical staff in an assigned office. Managing the provider appointment schedules and assisted the practice manager in the review of staff performance, implementation of policy and procedures and participated in the clinic's operations committee. Act as a liaison between the patient, provider, specialist, and an insurance company. Tracked authorizations as it applied to each managed care plan. Handling incoming calls regarding billing and general customer service within the guidelines of the billing department. 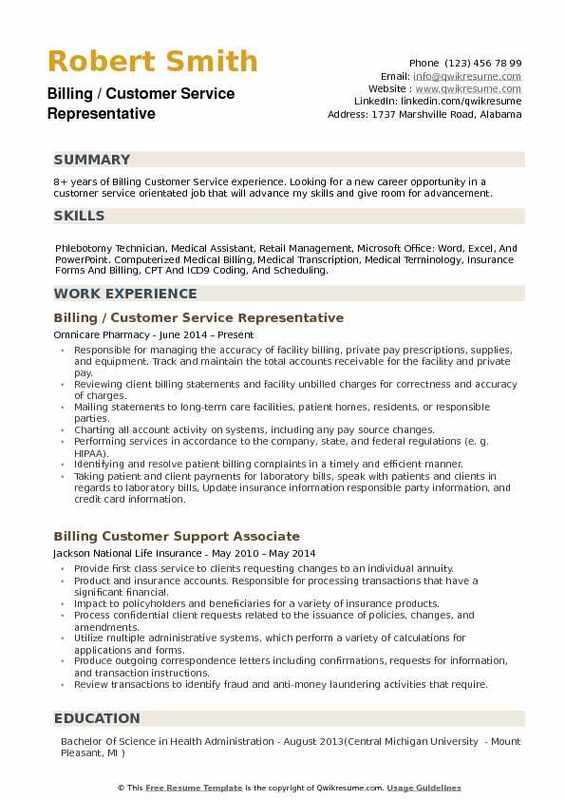 Objective : 5 years of experience as Billing Customer Service Representative is seeking to obtain a position that would allow me to serve as an asset to my employer while promoting career growth and utilizing my organizational, customer service, administrative, and communication skills. 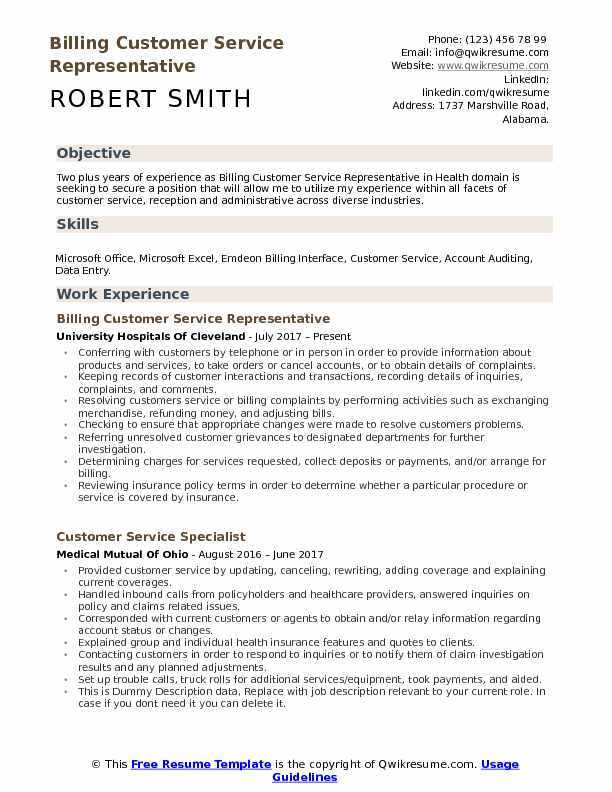 Skills : Microsoft Office, Organizational, Scheduling And Coordinating, Communication, Project Management, Accounting, Cash Handling, Customer Service, Training, Inventory Control, Office Management, Project Management, Data Entry, Receptionist, Medical Terminology, Medical Billing, Medical Transcription, Calendar Management. Receives calls distributed by automated call center system during established call center hours. Responds to inquiries efficiently, in order to maintain acceptable wait times for callers in queue. Updates demographic and insurance information in the IDX practice management system. Files claims, demands statements, and conducts account reviews, to ensure accurate account maintenance. Recommends and posts account adjustments, within prescribed dollar limits, and initiates refunds as warranted. Assists patients with the establishment of a reasonable budget plan to address self-pay balances. Acquired skills in active listening, critical thinking, problem-solving, and learned tools for escalating irate customers in a friendly and patient manner. Provides quality service to customers via phone in account activation, maintenance, billing, problem-solving, modification, enhancement and, when required, de-activation. Objective : I am seeking a challenging and rewarding position in a place where I can use my prior experience of one year as Billing Customer Service Representative and my accounting academics skills while furthering my professional development. Skills : The collection, Electronic Health Records, Excel, Medical Terminology, Medical Billing, Customer Service, Electronic Health Records Systems Including Meditech, Allscripts, Athena, And E-Clinical Office 2016 (Word, PowerPoint, Outlook, Excel). Answering on average 50-80 incoming calls in a busy call center position from patients insurance companies with account related questions. Working with the patient or insurance representative to resolve any discrepancies, complaints, collections, payment plans, and itemized invoicing. Reviewing accounts for accuracy in demographic and insurance information, insurance adjustments, coding, and payments. Receiving incoming correspondence for the billing department, sorting authorizations, denials, appeals, remits, and insurance-related questions and forward to the correct department. Verifying and loaded insurance to accounts, checking for accuracy in subscriber and account information. Informing our customers of the details of any of the promotions or discounts of the services provided and offered by the company. Entering the correct ICD 10 codes, to bill the patient insurance correctly. Identifying claims with coding errors to be reviewed and corrected, advising patients seeking. Summary : 8+ years of Billing Customer Service experience. Looking for a new career opportunity in a customer service orientated job that will advance my skills and give room for advancement. 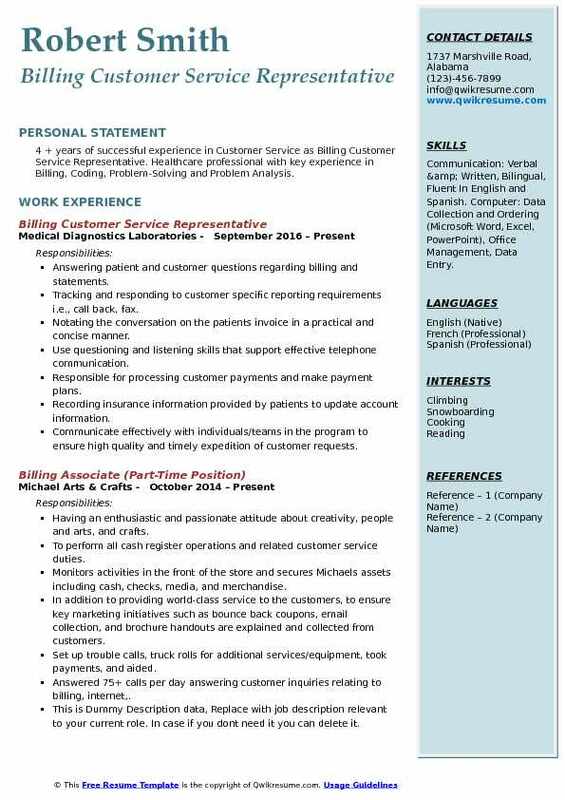 Skills : Phlebotomy Technician, Medical Assistant, Retail Management, Microsoft Office: Word, Excel, And PowerPoint. Computerized Medical Billing, Medical Transcription, Medical Terminology, Insurance Forms And Billing, CPT And ICD9 Coding, And Scheduling. Responsible for managing the accuracy of facility billing, private pay prescriptions, supplies, and equipment. Track and maintain the total accounts receivable for the facility and private pay. Reviewing client billing statements and facility unbilled charges for correctness and accuracy of charges. Mailing statements to long-term care facilities, patient homes, residents, or responsible parties. Charting all account activity on systems, including any pay source changes. Performing services in accordance to the company, state, and federal regulations (e. g. HIPAA). Identifying and resolve patient billing complaints in a timely and efficient manner. Taking patient and client payments for laboratory bills, speak with patients and clients in regards to laboratory bills, Update insurance information responsible party information, and credit card information. Mastering a "call flow" for quick calls, while performing account research, providing accurate. Frequently landed in the top performer lists for meeting and exceeding expectations on handle time, first call resolution, the voice of the customer surveys and quality assurance.